China’s latest plan for the country’s auto industry calls for two million ‘New Energy Vehicles’ to be sold per year by 2020 and seven million a year by 2025. The plan aims to boost total domestic vehicle sales from 28 million in 2016 to 35 million in 2025. 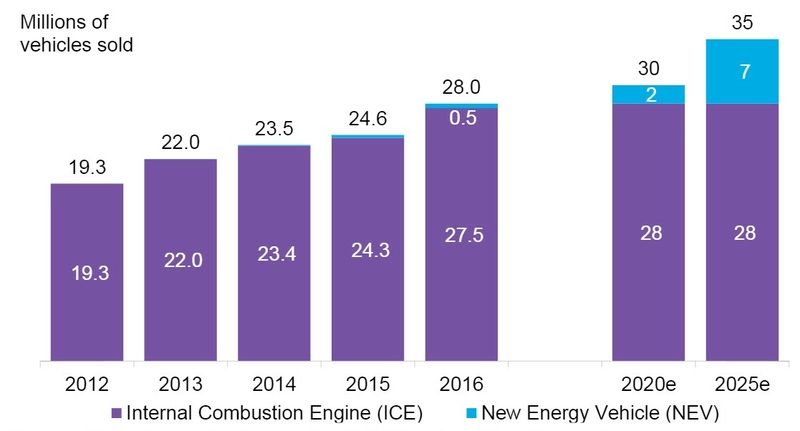 If the targets are achieved this would represent 20% of the domestic auto market in 2025, with all of the growth coming from electric models, starting now. The plan also aims to double average lithium-ion battery energy density and reduce battery pack prices to $150 per kilowatt hour by 2020. According to analysis from Bloomberg New Energy Finance, the price target looks achievable but the density target will be very challenging. Clients can access the full report here.